Want to learn how to use your Traeger Wood Fired Grill from an official Traeger representative? Well, you’re in luck because BBQ Concepts has a Traeger team member coming out for an exclusive in-store demo. Yea, we’re all about teaching you how to get the most out of your smoker. Traeger recognizes us as one of the most prominent Traeger product destinations. We’re bringing you a Traeger take on this beloved taco. It wouldn’t be wood-fired if we didn’t stuff these shells with pulled pork, brisket and wrap it all up with refried beans and a flour tortilla topped with cheese. Better make extra. When ready to cook, start the Traeger grill on Smoke with the lid open until the fire is established (4 to 5 minutes). Set the temperature to 325 degrees F and preheat, lid closed, for 10 to 15 minutes. Mix 1/2 cup of the sour cream with the refried beans. Place in an oven safe dish and put in preheated grill. Wrap the left over brisket and pork in a double layer of aluminum foil and place in grill. Heat beans and meats for 25 minutes or until warm. To assemble double decker tacos, spread a thin layer of the heated beans on a soft taco shell and wrap that on the outside of a crisp taco shell. Fill the crisp taco shell with the brisket and pork, guacamole, salsa, onion, sour cream, onion, cilantro, and cheese to taste. Enjoy! Barbecue Concepts of Las Vegas, Nevada has another amazing Traeger Wood Fire Grill recipe for you. 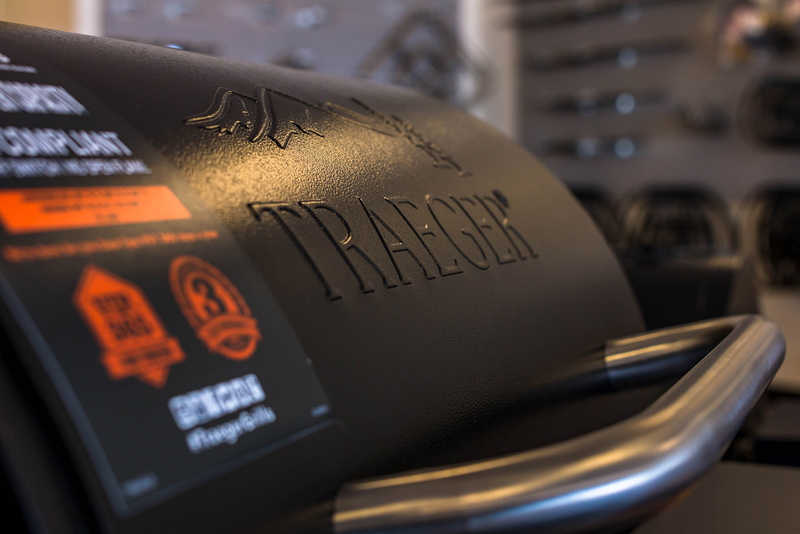 If you haven’t had a chance to stop in to our showroom yet, we’re excited to announce that we are an official authorized Traeger dealer here in the Las Vegas Valley. We’re also believers in the Traeger line of professional wood pellet smokers. We’re also one of the only places in Las Vegas that sell the Timberline series from Traeger. We invite you to stop in and see our huge selection of Traeger Smokers, seasonings, sauces, rubs, accessories and so much more.